2 double bedroom apartment with amazing Tagus river and Lisbon view. Close to Cascais and Lisbon. This 2 bedroom apartment sits on the top floor with fantastic sea views of the Tagus river. Lisbon Christ statue and Lisbon bridge views. 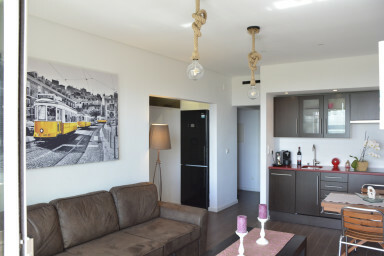 The apartment is located on the top floor of a closed condominium, includes an elevator and to top it off you get a fantastic view of Lisbon, The 25th April Lisbon bridge, the Christ statue and Costa Da Caparica on the other side of the Tagus River. You almost don't have to leave your apartment just taking in the view and fresh sea air! The apartment has a well equipped kitchen with coffee machine (Nespresso), dishwasher to simply throw all the dirty dishes in, an electric hob and washing machine. A toaster is also available for those wishing to start the say with toast and tea! The living area has a large sofa that sits 4 people and cable TV even though there are more important things and activities to do. The view speaks for itself and you can eat outside on the balcony just taking in the romantic Lisbon vista. The two bedrooms are equipped with lighting, electric blinds and two twin beds and one double bed. Towels and linen provided. The bathroom is decorated in mosaic tiles from floor to ceiling, offering a great modern looking bathroom - and of course there is air conditioning throughout. Within minutes you are on beautiful sandy beaches. A local swimming pool is also minutes walk located right next to the sea. Cascais and Estoril are approximately 18 minutes by train or 12 minutes by car. Lisbon is approximately 15 minutes by train or 20 minutes by car. Pingo Doce, the local supermarket is a 1 minute walk from the apartment. Great location between the beautiful Cascais bay and Lisbon city. Ideal for beach lovers who wish to relax close by to the sea. Horse riding, water sports and other outdoor activities available locally. the sea front has a great walk path ideal for relaxing evening walks or your daily jog. Very good appartment, Clean, quiet, magnificent view on the taje. i recommande this appartment. Великолепно! Очень красивое место- пляж, океан, все близко оасположено. Просторная квартира, очень хорошо укомплектована, комфортна для проживания. Хозяин Андрей очень приятный и коммуникабельный!